Welcome to the Blue Surf Townhomes in Panama City Beach, Florida! This beautiful facility offers gulf views and sits directly on the beach, making it the perfect place to spend a relaxing vacation. The townhomes sit just one mile west of Pier Park, and offer several upscale restaurants and shopping all with in a short distance. Some of the local favorite restaurants include Sharky’s, Margaritaville and Red Rae’s. Other restaurants in the area include Crab Trap, Capn' Daves, Fat Clamenza's Italian, Kenny D's Bonefish Grill, Busters, and Calhouns Deli and restaurant. Spend your mornings relaxing on the white sandy beaches and your afternoons parasailing or paddle boarding the Gulf waters. There are also golf courses nearby as well as deep sea fishing charter boats. Panama City Beach has been a prime vacation destination for travelers for decades. Come experience why so many love calling Blue Surf in Panama City Beach their home away from home. 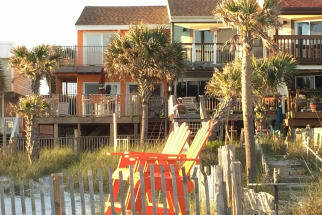 Plan your next vacation to Blue Surf Townhomes with emeraldcoastbyowner.com. ECBYO puts you in direct contact with our Blue Surf owners and assures you the best price for your vacation rental. We hope you enjoy your stay at Blue Surf Townhomes on the Emerald Coast!